Hastings Fat Tuesday is celebrating its 10th anniversary in 2019 and is now inviting applications from musicians across all genres, as well as from stage managers and potential volunteers, for this special edition of the annual music festival. Hailed as Hastings’ answer to SXSW in Texas, or Brighton’s The Great Escape, Hastings Fat Tuesday is also the UK’s largest Mardi Gras celebration and has its own distinctive flavour. Unplugged Saturday (March 2) - a hugely popular acoustic afternoon in Hastings Old Town, with 200 individual performances. Fat Tuesday Tour (March 5) - the climax of the festival with 24 of the best emerging and established bands touring Hastings Old Town venues, performing three 20-minute sets each. Applications should be made online at apply.hastingsfattuesday.co.uk by the deadline of 1 December. Applicants will be asked to provide a bio, information about recent gigs, and links to their music. The festival is also inviting applications from those interested in managing one of the 16 stages as part of the Fat Tuesday tour. Applicants must be over 18 and available 6-11pm on Tuesday March 5. Applications are also welcomed from volunteers who would like to support the event and have the opportunity to see and hear a wide range of music across the five days. Tasks may include: gathering audience feedback, staffing the information desk, handing out flyers, and stewarding at events. Volunteers must be 18 or over by March 1 2019. Visit https://www.hastingsfattuesday.co.uk/get-involved to apply to be a stage manager or volunteer by the December 1 deadline. More details on the website. 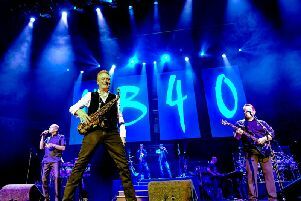 Tumour diagnosis forces UB40 star Brian Travers out of 40th anniversary UK tour.